NASA's Mars Pathfinder mission consisted of a lander and a small rover called Sojourner. The Mars/Mössbauer group led the magnetic properties experiments on Mars Pathfinder. Ramp magnets, mounted at the foot of each ramp. The ramp magnets were designed to attract and hold only the highly magnetic dust (and soil) particles in order to investigate any possible correlation between the elements iron and titanium in the magnetic phase(s) of the particles. The ramps were there to allow the small rover, Sojourner, to reach the ground safely. 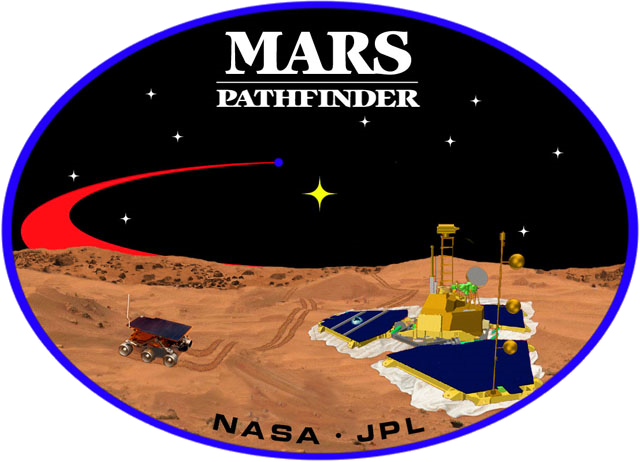 All the Mars Pathfinder magnets were exposed to the Martian atmosphere, allowing airborne dust to accumulate on them for the entire mission (83 sols (Martian days), which is roughly 85 Earth days). The magnets were imaged at regular intervals by the Imager for Mars Pathfinder. NASA's homepage for the Pathfinder mission. Click here for a higher-resolution version of the Pathfinder insignia. Image credit: NASA.